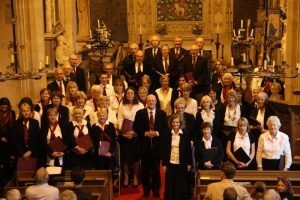 The Wolds Choir is a group of singers from Wymeswold and the surrounding villages of Burton on the Wolds, Hoton, Prestwold, Widmerpool, Wysall and Willoughby. The choir is around 30 strong, and performs two or three concerts per year. The choir has built up a good reputation in the local area for the quality of its singing. There is no pre-requisite knowledge of music required, apart from a basic understanding of notation and the ability to sing in tune. All pieces are taught to the choir at practice nights, which are on Wednesdays from 7:30pm to 9pm at the Methodist Church in Wymeswold. New members are welcome if they can commit to regular attendance. Fees are £15 per term. For reference, this is a list of pieces that we have sung over the past years. Christmas 2017: Advent Carol Concert performances Wysall Wed 6th December, Wymeswold Sun 3rd December. We prepared a lighter programme and sang a Concert in May 2015 to a full Willoughby Chuch with the Willoughby Choir. Swing Low, Sweet Chariot – Trad. Our Annual Christmas Concert was in the Chapel this year. We sung two performances of Stainer’s Crucifixion along with the Willoughby Choir, along with the Cantique de Jean Racine and a piece from The Armed Man. We shared the platform with Charnwood Concert Band on Saturday 7th December, 7pm to perform our Annual Christmas Concert. We also supported a Concert for Save The Children in Rempstone on Saturday 19th May with a selection from the above. We performed the following programme with the Willoughby Choir and the Pierrepont Singers on Tue 7th and Wed 8th April 2009.